If you are planning a trip to the Lake District for a short break or a holiday then take a look at some of the super self catering cottages, lodges and apartments near all the popular Lakes - from Windermere and Ullswater to Coniston and Wast Water. Coniston Water. Made famous for Donald Campbell's water speed world records, Coniston is the third largest lake. Towns near by include Lowick, Port Haverigg and Coniston. A popular base for walkers. Grasmere Lake. A smaller lake and therefore a power boat free zone, 19th Century village buildings, once a home to William Wordsworth, not surprisingly Grasmere is a popular holiday choice. Ullswater. Considered one of the most beautiful lakes, Ullswater is the second largest of The Lakes. Glenridding at one end is a perfect base for walkers wanting to climb Helvellyn (England's 3rd highest mountain) while the lovely Pooly Bridge is at the northern tip. Haweswater. The most easterly lake with no settlements on its shores makes it a popular place to hike and explore. Thanks to a dam this small natural lake is now over 4 miles long. Rydal Water. Another lake with connections to Wordsworth that make it a popular place to head in the central Lakes area. It's not far from Windermere, Grasmere and Ambleside. Esthwaite Water. A smaller lake that is particularly popular for its trout and pike fishing. Towns near to Esthwaite Water include Ambleside, Hawkshead and Outgate. Crummock Water. A 2.5 mile long lake between Loweswater and Buttermere. Bassenthwaite Lake. As one of the largest and shallowest lakes, Bassenthwaite is a favourite place to head for birdspotters in search of Ospreys. Townds close to Bassenthwaite include Keswick, Cockermouth and Silloth. Ennerdale. The most westerly lake and one of the smallest. Definitely one of the quieter lakes to visit, making it a perfect place to get away from it all. All good for cycling and walking. Derwent Water. Surrounded by Fells, it is no surprise that Derwent is known for its wonderful scenery. A regular passenger launch ferries people to popular landing stages including Keswick, and Lodore Falls. Loweswater. A peaceful, smaller lake that is perfect for a relaxing walk. Red squirrels can still be found in the area and the National Trust Watergate Farm is near by. As if the great walks, riding, cycling fishing and water activities is not enough to keep you, your part, faimily and friends entertained, The Lakes is not short of other tourist attractions. 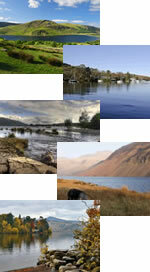 Check out some more attractions in the Lake District and Cumbria.